Synopsis: Lady Snowbload returns after a 20 year long hiatus! Ikegami Ryoichi takes over the art while Kazuo Koike continues to deliver the same writing that made Lady Snowblood a hit originally. This volume contains three stories that take place after the original series. 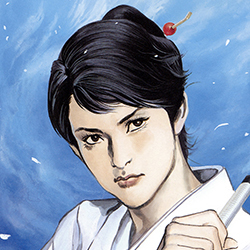 A politician and his wife try to lure Yuki out of retirement to exact their vengeance. A Buddhist nun tries to escape her sisters and bring the true teachings of her sect to the populace with a stolen mandala. She is rescued by Yuki but terribly wounded in the process. A police official tries to get Yuki to assassinate another assassin.